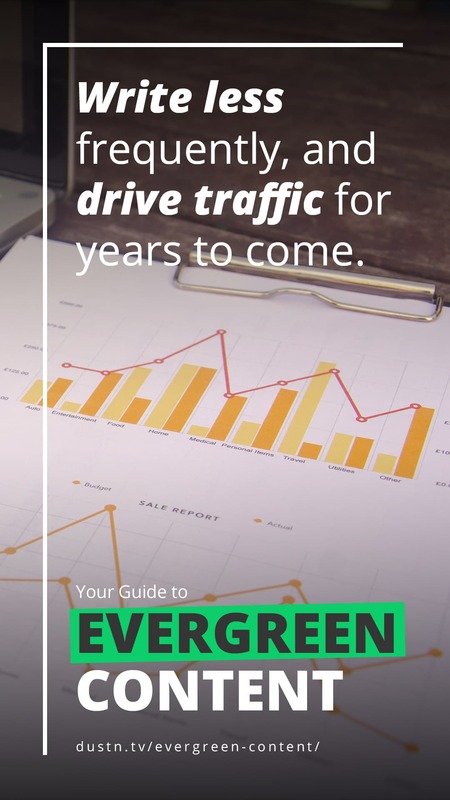 Do you have an Evergreen content strategy? Here’s why you should have one, and how to start. If you’ve been blogging for six months or six years, you should have an Evergreen Content Strategy. 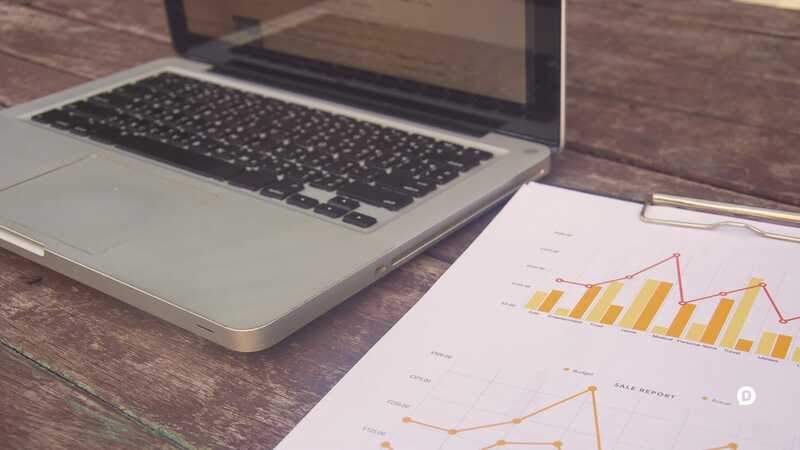 This type of blog content can drive traffic and conversions for years to come, allowing you to write less frequently but continue to grow your audience. An Evergreen post is a blog post in which the content has long-term value that won’t diminish with time. The idea is that the content will retain its value and usefulness for years to come. 41% of my traffic over the last year came from only 5 blog posts. Taking it a step further and factoring in all of my evergreen posts, they account for around 55% of the total traffic driven to dustinstout.com in the last 365 days. And they’re all well over a year old. I’ve recently updated a few of them so the publish dates have changed, but they were all created in 2014 or before. Great Evergreen blog posts allow you to write less and continue to grow your site traffic, subscribers, leads and conversions. What Makes an Evergreen Post? There are many different types of evergreen posts, which we’ll get to in a minute. But you need to understand that there are some common traits that you want to keep in mind in order to squeeze the most out of them. A perfect piece of evergreen content contains timeless information or assets that can be updated as needed. Generally speaking, you want to create something that doesn’t require much maintenance. Sustainability means that a year or two (or three) from now someone can stumble across this post and still find value in it. That means anything that is time-sensitive is no good. Also, anything that is changing rapidly (more than once or twice per year) is probably not a good subject. You don’t want to have to be updating the information too frequently to where you’re sick of it. One of the keys to creating content that is shareable is making sure you have great visuals. 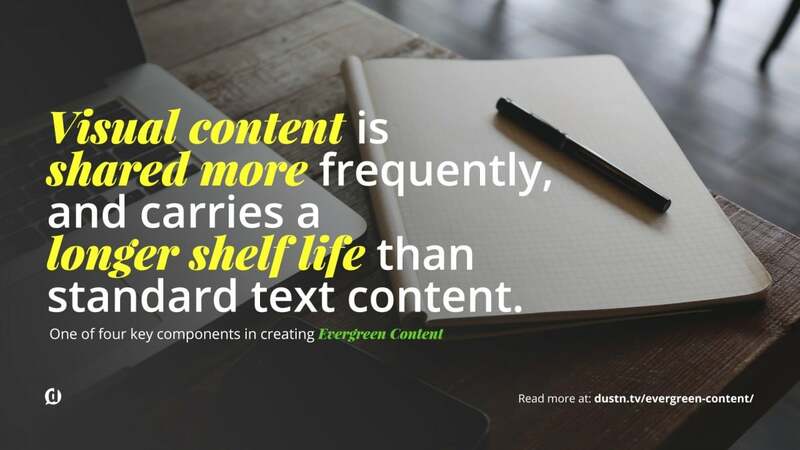 Visual content is shared more frequently, engaged with more and carries a longer shelf life than standard text content. With Google+ and Pinterest being primed visual platforms for long-term discoverability (more on this soon) it’s always good to create visuals that will grab eyeballs. 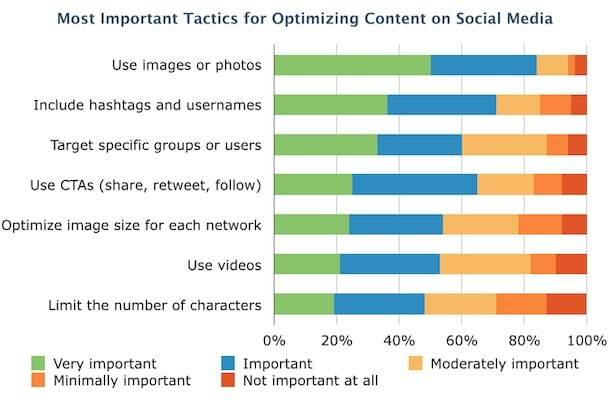 Be sure you also optimize your images for highest potential SEO benefits. Many people skip this step, and that’s where you can really win out over the competition. You want your topic to be laser-focused. By keeping your topic narrow you ensure that it meets a very specific need for your target audience. On top of that, you want to ensure your topic is targeted at the beginners. Why? Because those are the types of people searching for the types of posts you’ll be creating. Experts aren’t likely looking for your content if they’re already an expert in it (unless they’re looking for support for their own articles). There’s also a higher volume of beginners than there are experts at any given time. Aim to create content that is helpful at the entry-level. Ramsay of BlogTyrant has a lot more to say about the subject if you still need convincing. We’re not talking a quick 300-500 word article here. Your evergreen posts need to be meaty— I’m talking 1,500-2,000+ words. With Google favoring blog posts that are more than 2,000+ words and their recent Panda update penalizing “thin” content, this is just a good blogging strategy in general. But it’s all the more important for an evergreen piece. You want to have something that people can really dig their teeth into— something they couldn’t possibly retain in one sitting. This will increase it’s likelihood of being shared and bookmarked so they can return to it later. If you need more ideas, there is a fantastic list of Evergreen Content ideas from the Buffer team that I highly recommend. Once your epic post is finished there are a few things you’ll want to do. You don’t have to do all of these, but they’ll definitely help. I’m sure you already know how to share your blog post on social media. That’s a given. But you’ll want to take it a step further and promote it like your life depended on it. If you’ve done your job— this is going to be a highly useful piece of content and odds are you know people who will benefit from it. Share your post directly with the people you think will appreciate it most. Tell them you were thinking of them when you created for it (if that’s true of course). Let them know you’d be honored if they read it and if they find it useful you’d love it if they shared it. Direct email is not dead people. Don’t be afraid to email your personal contacts if you know it’s something they’d find interesting or helpful. If you’ve done your job well, then it should get a decent amount of traction right away. It doesn’t have to be a viral hit but it should be getting above average shares, comments and traffic. Do you have a spot on your blog where you highlight certain “best” or “most popular” posts? You should. On this blog, I have a section on my homepage that shows my top 3 most popular blog posts. Additionally I have a second section titled “Free Social Media Resources” that is also a place for my evergreen posts. Your About page is also a great place to feature some of your best/favorite content. 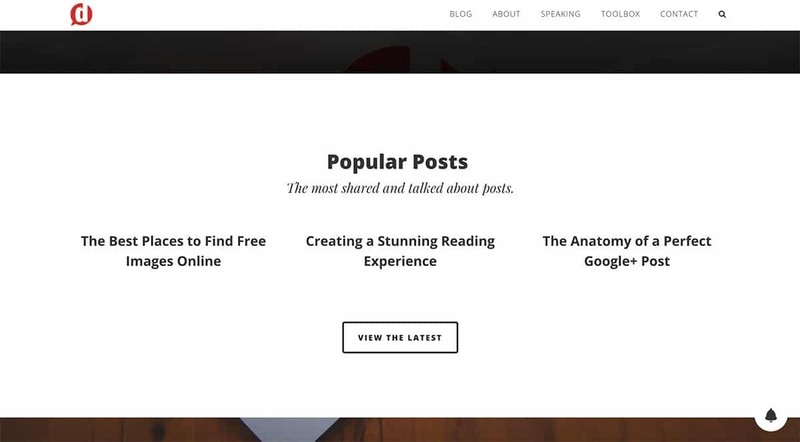 Popular posts widgets are also a great way to showcase your best content. Since your evergreen content should be amongst the most popular, having a Popular posts plugin would be very helpful. Once the initial buzz for the article is over, be sure to continue adding it into your social share schedule regularly– at least twice a month. Remember that social media moves rapidly. Just because you shared something once doesn’t mean that everyone in your audience has seen it. If you have a content calendar, be sure you work your evergreen posts in regularly. Another idea I recently discovered is to create an evergreen queue in Buffer. Read point number 2 in Kevan’s post. This will allow you to keep ready-to-go social posts for streamlined recurring sharing. One way you can keep the momentum coming, or add some more fuel to the fire is to repurpose your content in different formats. Hopefully, you’ve already included some visual elements as I previously stated— that’s crucial. But maybe you can take it a step further and create some alternative media formats to increase the content’s reach. Always be sure that when you repurpose or republish your content outside of your blog you always create a call to action and link back to the original piece. That’s where you control the environment and that’s where you can continue to refine and update it. You will want to continue to link to this post whenever appropriate in newer blog posts. You can even go back and find your older posts that keep getting traffic and add links to this post. The more you link to that evergreen content, the more authority you build for it in the eyes of search engines and the more opportunity you give people to discover it. Every six months or so you’ll want to revisit and update the post to keep it as relevant or valuable as possible. The investment on these evergreen posts can be heavy at the beginning, but they can be well worth their weight in gold. Plus, updating them is usually easy since most of the work is done, and can help when you don’t have the time to create a brand new post. Once you’ve created these evergreen posts don’t make the same mistake I did and miss out thousands of potential email subscribers. In my follow-up post I share how I boosted my email opt-ins by 400% in a single day with one simple strategy. Have you created an evergreen post before? Want me to take a look and offer feedback? You can leave a comment by clicking here. This was so informative and a big eye opener, As I’m a blogger for only four years now and love it and still way to go, But this article shortens that learning curve bloggers get as they start to write their first blog. And the idea of just doing 3-5 good blog post and keep sharing it over and over is something i will implement from now on! Glad you liked it Terrence! Love this post. I just published my blog and will keep these tips in mind. ???? I especially appreciate that you included the point “Keep Them Updated” at the end. Of course, evergreen content should still be just as useful a year or two from now as it is today. No doubt about that. But it would be foolish to think that every nuance or tutorial will be exactly the same, step-by-step. Updates go a long way to keeping our content fresh and relevant, especially when a user finds it through organic search. Not to mention, it’s my understanding that updates (especially with forward linking) can do a lot for search engine rank. Thanks for adding to the conversation Matt! Got any great evergreen posts you’re particularly proud of? Well, sure Dustin! If you’re asking! There are so many people taking pics of their awesome foodie adventures, but a lot of people still aren’t sure what goes into creating a food blog or how to monetize it. I appreciate the opportunity to share! Hey Dustin, some good points as usual. BTW I never came across this feature before – Popular posts is one of the many features of Social Warfare. Which section is that on? Ah, this was eye-opening. Hadn’t noticed before, but of all the various blog posts I’ve read throughout the years, nearly all of my favorites have been evergreen posts. Glad you liked it Hannah! Worked on any great evergreen posts of your own? What I have done is identified those evergreen posts that seem to have attracted the most interest, and I find fresh ways to get the word out about them. Not all that is evergreen is equally attractive. Right on David! Got any examples?